To downlaod and buy macros, please go to the PatternMaker Website. 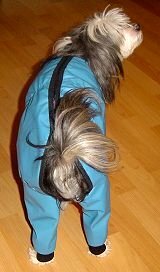 Take the measurements along the dog's body according to the picture. Do not add ease. The measurement from the groin to the sitting bone is taken along the thigh curvature from groin to sitting bone (under the tail). It is the circumference of the thigh at this place minus the inside of the thigh. The front height and the leg measurements as well as the cuff circumference are garment measurements. Measure them as you want them to be in the ready garment. When measuring the leg lengths, do not subtract the height of the cuff ribbings, the macro does it for you. You will be asked to enter the height of cuff ribbings in the measurement dialog box. If you do not want to sew ribbings to the cuffs, enter this measurement as zero. If you choose the "No hood" option, the macro drafts a 2*6 cm:n (2 * 2 3/8") high ribbing for the neck opening. There is a PatternMaker measurement table for dogs. Use it to create a measurement table for your own dog. The measurement table file is in the same folder than the macro. To read about creating and using measurement tables click here. IMPORTANT! Measuring a dog is not always easy. Therefore, always make a muslin first to check the measurements. Change the measurements if needed. If the fabric for the muslin is different - e.g. thinner than the fabric used to the final garment, take this into consideration when fitting the muslin on. Cut the garment pieces on folded fabric. Cut the abdomen piece and the hood on fold. Sew zipper to the zipper opening (neck - tail base), closed end towards neck. Leave an opening at the neck end for the leash. Sew zipper fly parts together right side against right side. Leave the straight edge open. Turn the fly piece right side out and edgestitch. If you sew the suit from fabric which does not ravel, you can if you want to, sew the fly piece of single fabric. Sew the fly piece below one side of the zipper along the ditch. Sew elastic to the inside of the garment with zigzag around abdomen according to marks in the patterns. If you want to you can sew a casing for the elastic. Feed the elastic to the casing and fasten at both ends. You can replace the elastic with a draw string which you feed into the casing to regulate the fit of the garment. In this case you should, however, replace main part of the draw string with elastic to make the garment more flexible and comfortable to wear. To be able to feed the draw string in the casing, sew button holes to the garment at both ends of the casing before you attach the casing. Or you can feed the draw string to the casing through its ends and bind the string inside the garment. Sew seams of the cuff ribbings, fold ribbings in two wrong side inside and sew them to the leg cuffs. Stretch them when sewing. If you sew a ribbing to the neck opening, sew it to its place the same way. 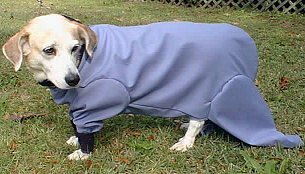 If you sew a hood to the suit, replace the neck ribbing with it. The front edge of the hood is finished with bias binding. 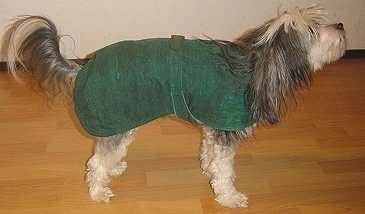 The hood cannot be too tight, otherwise the dog may not approve it- If needed, feed elastic inside the bias binding. Sew the visor brim pieces together right side against right side. Turn the visor brim right side out and edgestitch along the curved edge. Overlock the straight edge. If the fabric is thin you can iron interfacing to one or both visor brim pieces. Sew the visor brim under the front edge of the bias binding of the hood along the ditch. You can use ribbing for the hood. You can leave the visor brim away. If you sew the visor brim, you can - when the weather is good, turn it on top of the hood so that it points towards the back of the dog. That way the visor brim avoids less the dogs visual feald. If you want to sew a cape and not a complete suit, alter the patterns according to the drawing and the pictures below. 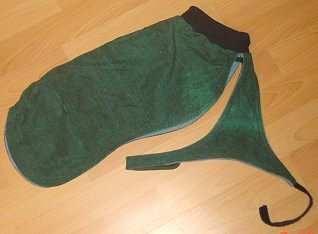 I want to express my special thanks to Rebecca Todd, Sterling, Virginia, USA who kindly shared her knowledge and experiences in sewing hoods to dog suits with me. I also thank all the PatternMaker users who participated in this project by testing the macro when it was being programmed.